It seems most of us are not very interested with PC-like action games on our mobile phones. Yet, quite many of us love the idea of using them for casual games. According to a recent report by Parks Associates, a market research and consulting company specializing in emerging consumer technology products and services, consumers perceive mobile phones as casual gaming devices with puzzle and card games at the top of the list. Amazingly, less than 10 percent of on-the-go Internet gamers say they are interested with core or console-centric games for their mobile phone but 55 percent of them "want to play puzzle and card games on mobile phones". Following are 6 prominent mobile game destinations found on the web. 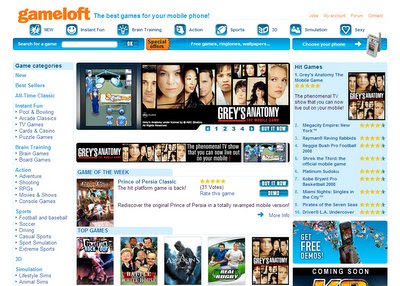 Gameloft is an international publisher and developer of video games for mobile phones established in 1999. The company owns and operates titles such as Block Breaker Deluxe, Asphalt: Urban GT and New York Nights and creates games for mobile handsets equipped with Java, Brew or Symbian technology. Gameloft means business. Their partnership agreements include brands such as Ubisoft Entertainment, Universal Pictures, Dreamworks Animations SKG, 20th Century Fox, Viacom, Sony Pictures, Touchtone Television, Warner Bros., and more. 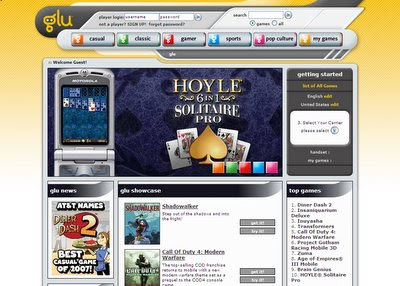 Glu is a global publisher of mobile games founded in 2001 and based in San Mateo, California. Game portfolio includes original titles Super K.O. Boxing!, Stranded and Brain Genius and titles based on major brands from partners including Atari, Hasbro, Warner Bros., Microsoft, SEGA, Sony and more. 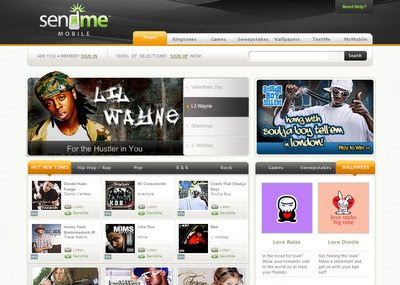 Sendmemobile is a leading provider of direct to consumer mobile entertainment and wireless content. 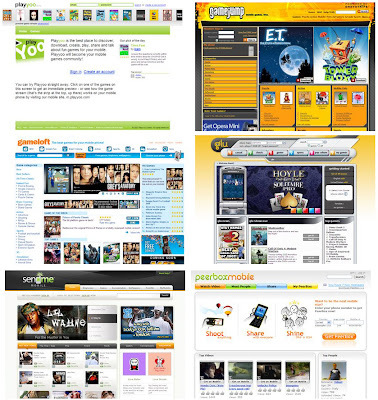 The site offers the broadest selection of mobile subscription services currently available online in the US. Content includes interactive mobile trivia, ringtones and wallpaper, mobile sweepstakes. With GameJump all games are free. You never get charged a dime as everything is paid for by advertisements shown before and after the games. There is no sign up for a subscription or a token system or a premium SMS service. 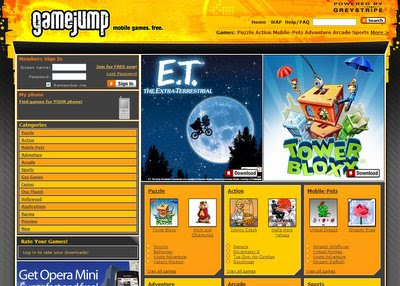 GameJump also have no phone company relationships, so they don't get any money from them either. 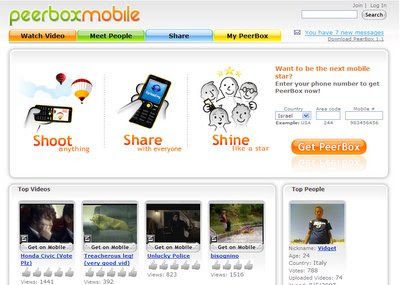 PeerBox Mobile is a classic web2.0 venture, integrating social networking, user generated content and file sharing, only they do it for your mobile phone. People with PeerBox can watch and share videos and music files directly from their mobile phone. With user base in 178 countries, PeerBox is a mainstream social environment for mobile users. 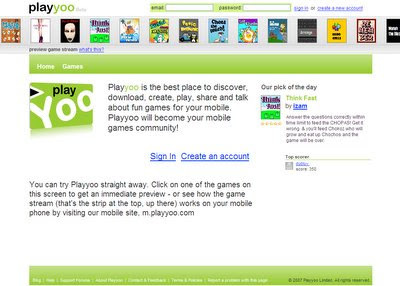 Not exactly a mobile content portal but, same as peerbox, also an interesting destination for mobile gamers, playyoo is a growing mobile content community with a web2.0 approach. Here you can download and play but also create and share fun games for your mobile. Frank Shepard Fairey who usually goes under his middle and last name Shepard Fairey, is a contemporary artist, graphic designer and illustrator who believes that Barack Obama should be the next President of the United States. 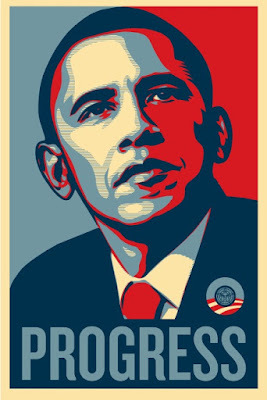 Starting next Wednesday, January 30th, Fairey's screenprints titled PROGRESS will be put on sale online to support a larger statewide poster campaign. The screenprints are edition of 350 sized 24" x 36". Mankind took a major step today as an ambitious effort codenamed The 1000 Genomes Project involving sequencing the genomes of at least a thousand people from around the world was announced in England. The 1000 Genomes Project will create "the most detailed and medically useful picture to date of human genetic variation". Multidisciplinary research teams participating in the 1000 Genomes Project will develop a mapped view of biomedically relevant DNA variations "at a resolution unmatched by current resources". 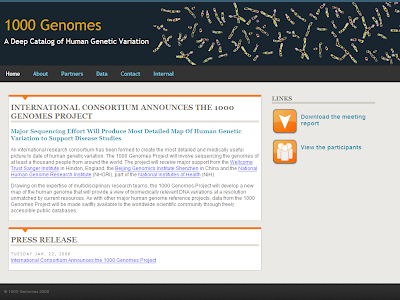 According to the official announcement data from The 1000 Genomes Project will be shared with the worldwide scientific community through freely accessible public databases. "The 1000 Genomes Project will examine the human genome at a level of detail that no one has done before. Such a project would have been unthinkable only two years ago. Today, thanks to amazing strides in sequencing technology, bioinformatics and population genomics, it is now within our grasp. So we are moving forward to build a tool that will greatly expand and further accelerate efforts to find more of the genetic factors involved in human health and disease." "This new project will increase the sensitivity of disease discovery efforts across the genome five-fold and within gene regions at least 10-fold. 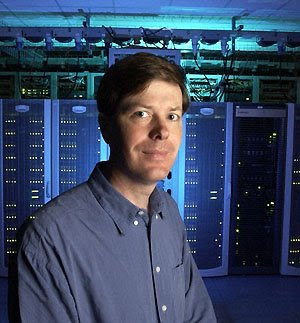 Our existing databases do a reasonably good job of cataloguing variations found in at least 10 percent of a population. By harnessing the power of new sequencing technologies and novel computational methods, we hope to give biomedical researchers a genome-wide map of variation down to the 1 percent level. This will change the way we carry out studies of genetic disease." 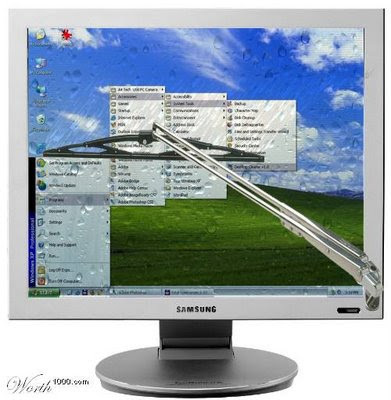 Click screen for Automatic Monitor Cleaning. 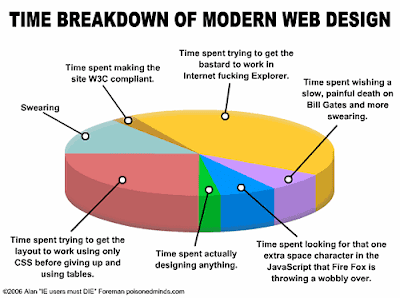 I was tagged to this meme by Leena of ConceptisAddict. It's a known fact that Viral linking has a lot of benefits. 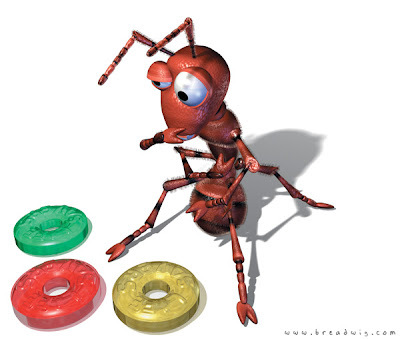 Those who don't know about viral linking, click here. What we are going to do now is follow the same thing, but with a difference. Usually, we post just people's links as such. But the rules are a bit different. Some trends can be considered as improvements and are easily likable. Others should better be left behind. Here are a few examples. Take this new trend from the land of "no one can be freakier than us" for example: fake alcoholic drinks for children. You read correctly. We can't let them have the real thing, what can you do, but hey! why not get them used to it with an item of a product line recently released by Sangaria? 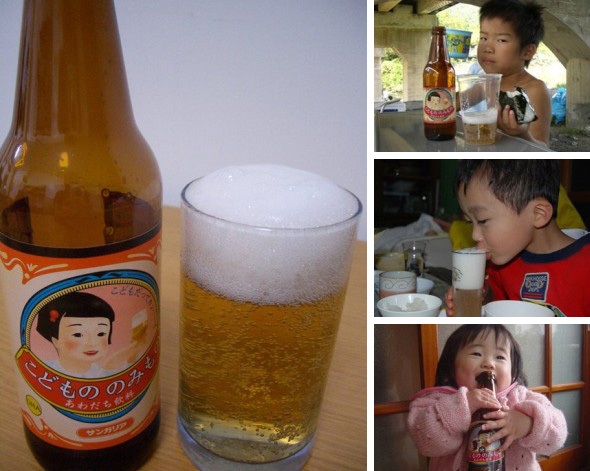 An apple juice flavored fake beer designed to make children imitate a common adult practice! This incredible drink creates the familiar foam when poured into a glass and is sold in all familiar beer container form factors including bottles, cans and six-packs. Branded as Kodomo no nomimono (Japanese for 'Children’s drink') Sangaria's product line also includes children’s versions of wine, champagne, and cocktails in case your kid is not of the beer type. As Agent Cooper used to say: Man-o-man. More about this on kilian-nakamura.com, a blog from CScout about trend and market research in Japan. Did you know owls regurgitate football-shaped objects twice a day? Well, they do, and those objects contain the crashed skeletons of at least one owl meal, usually a mouse, vole, shrew, or small bird. Owl pellets are commonly used in elementary schools as food web teaching accessory. However, at least according to the publishers of Owl Puke: Book and Owl Pellet they were virtually unavailable at retail before "professionally collected, heat-sterilized owl pellet" items were - believe it or not - stuffed into the above two-color illustrated book by Jane Hammerslough. Now don’t get us wrong here. We like all kind of birds, including owls. We know "kids love science especially when it's hands on". We also know they love "yucky stuff" but having this particular educational item in my home... we don't know about that. Price: $11.16. Though the top side of the Ouch Voodoo Doll (& Toothpick Holder) was designed to hold your favorite oral fixation toy, this product is first of all a tension reliever. Yet this is not the kind of accessory your kid's teacher is likely to allow in class. 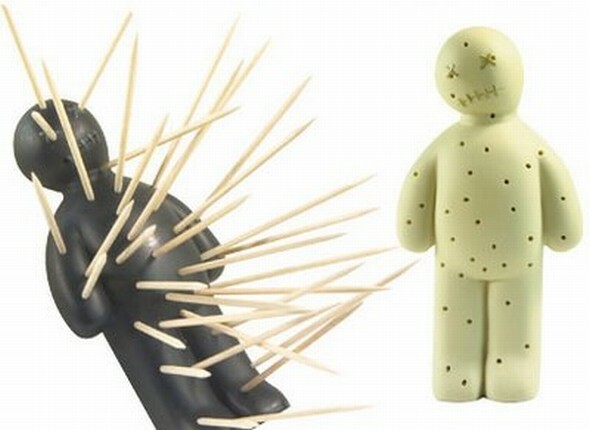 According to baronbob.com, an online shop "crusading against the common gifts since 1998", this Voodoo Toothpick Holder is also; an excellent conversation piece; the next great party starter; slightly (?!!) creepy; and a whole lot of whole poking fun. Price: $6.95 at baronbob's. I am just not sure about the slightly. 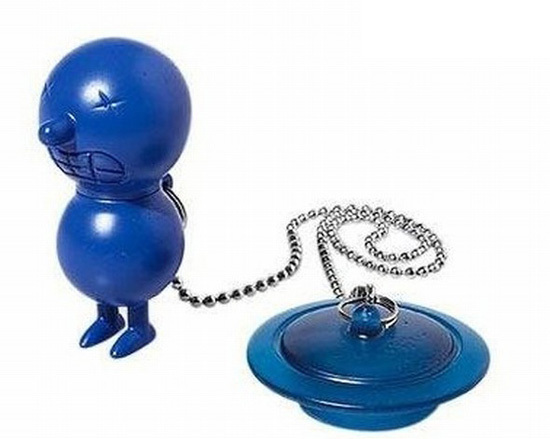 The attractive artifact shown above is packaged as a keychain, so your kid can always have one of his toilets handy when feeling like freshen up a little bit. Your 12 years old likes her own flavor in everything? 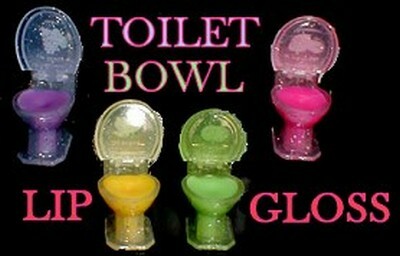 The Toilet Bowl Lip Gloss comes in Grape, Lemon, Apple, and Strawberry. They are chosen by the Toilet Bowl folks but there is a promise that if you buy more than one, they'll make sure you get different ones. How lovely. Price: $1.99 too much at stupid.com. Everyone wants his kid to have artistic qualities. That is to some extent, not necessarily "all the way" as they say. It may indeed be that there were not many greater characters in the history of art than this fellow who chopped his ears off "in the name of love". 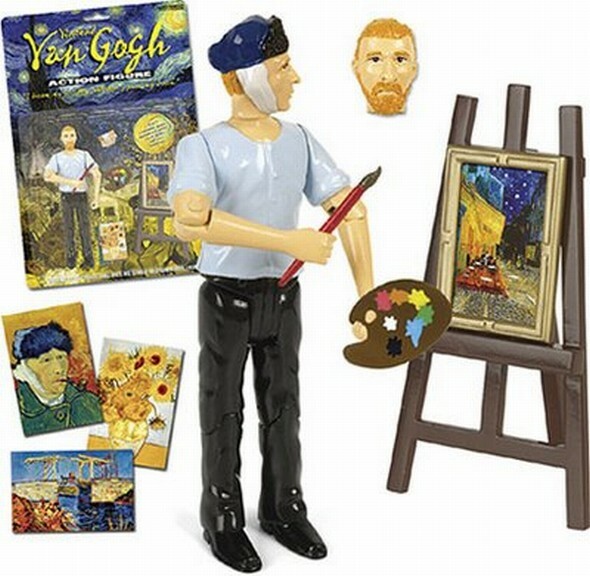 We all know that but with the Vincent Van Gogh Action Figure, your kid can now enhance his artistic tendencies and identify with Vincent "before and after his self-conducted surgery; with 2 ears or with bandaged head". Explicitly suggested to be used as "an inspirational tool" this masterpiece is accompanied with a set of paintbrush, palette, an easel, a frame and some mini masterpieces to display. Spec: 5-1/4" inches tall vinyl figure, two interchangeable heads. Art never looked more frightening. Price: $9.95 also at baronbob's. The above piece of high tech technology is claimed to be a "replacement for the Whoopee cushion" and being a remote controlled device it is promised that no one will ever know who's to be blamed. 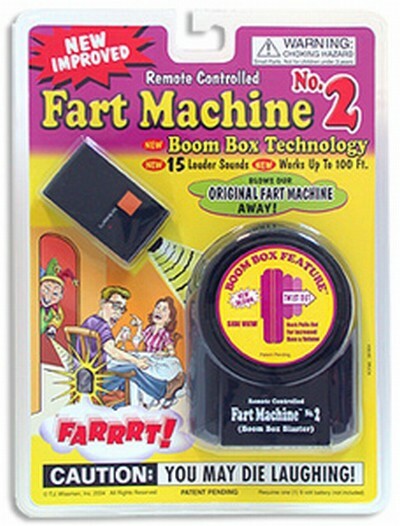 From parties and school class to elevators and your living room, your kid is promised to use the Remote Controlled Fart Machine anywhere as it works up to 100 feet and through walls. Sold, for those who are interested after all, on Spoonsisters.com. Price: $22.00. I guess some people would do anything for money. Lastly, meet Mr. Suicide Bathtub Plug, a universal bathtub plug designed for Alessi in 2000 by Italian designer Massimo Giacon. The item features a "dead" figure that floats to the surface when you take a bath. Pooky, a product reviewer on the Amazon shop, reports the chain can be separated from the plug, and attached to the included tiny suction cup a great feature for kids who "might play with the little guy, and pull out the plug by mistake". Sorry. Just a liiiiittle bit too spooky for me, Pooky. $29.95 on Amazon and your kid will be happier than ever. 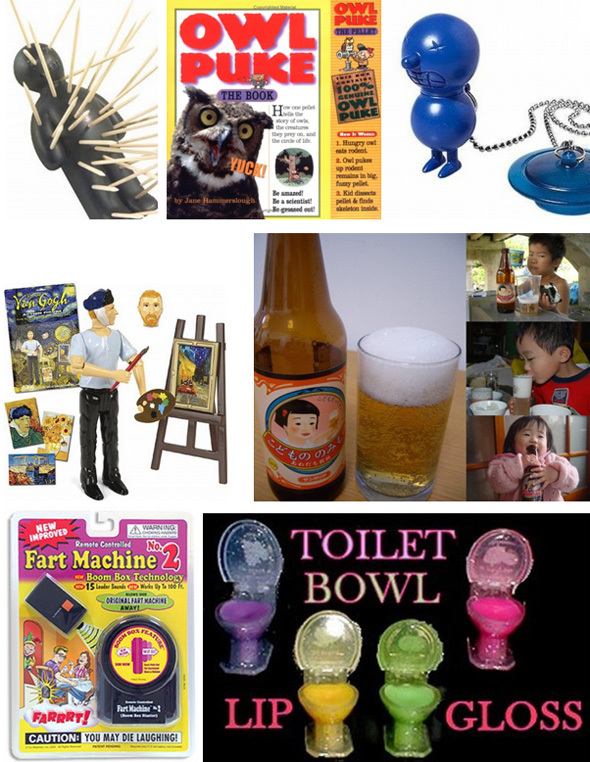 Know any other products you rather your kid won't even know about? Leave a comment. I'll be happy to follow-up. We all met the yellow New York City Taxi Cab. If not while taking one for a ride around Manhattan then through countless of TV shows and motion pictures. Now this iconic symbol is reproduced in a pair of hand crocheted booties. Tailored for your tiny offspring it even has a gentle elastic keeps booties from falling off your treasure. Sized for up to 12 months housegeckos. $33.00 at spoonsisters.com and they are on your toddler. It took me almost 48 hours to follow up on this but here I am, after uprising blogger star Leena from ConceptisAdddict had just honored me with a Thinking Blogger Award so I'd like to use this opportunity to thank her. I know I am having some serious writing problems so having a super-math-teacher thinking I am capable of thinking straight is kind of a relief. Note: Please, remember to tag blogs with real merits, i.e. relative content, and above all - blogs that really get you thinking! Cooper of Wonderland or Not has been my number one 'here is something you should really spend time thinking about' blogger ever since I've 'met' her. Cooper is merely 23 and already writes like a shining star. As much as I see blogging as the most important aspect of the new media age, to me her writing is far more than blogging. I would say Cooper writes social online poetry. Niel from Only Dead Fish (swim with the water) who is also Director of Marketing & Strategy for the commercial functions of IPC Media. 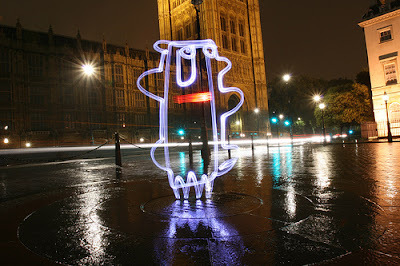 Neil's writing about advertising, digital marketing, media, communications, planning and the web is always enlightening. Super mom, skilled mountain climber, recovering attorney, post-modern neo-feminist and an enthusiastic regenerated dyke, Becky of Just a Girl in short shorts talking about whatever has always something new to think about. If you happen to be a male chauvinist this is one online destination you should not visit. Don't say I didn't warn you. Other than being the coolest VP of Experience Design (with Critical Mass) David Armano of Logic+Emotion is also one of the most respected interactive marketing bloggers on the Internet and has been my personal guru on the subject during 2007. Armano's blog turns passive consumers to active participants but it also turns passive readers to active bloggers. Other than a living legendary Internet guru Danah Boyd of apophenia, aka danah boyd, is also a PhD student in the School of Information (iSchool) at Berkeley and a Fellow at the Harvard Berkman Center for Internet and Society. To me Danah is the indisputable authority for everything about identity, context, social network sites, youth culture, social media and everything in between. I first stumbled Danah's name during my studies for a Social Science and Communications degree but her personal blog was one of the reasons I started my own online presence. 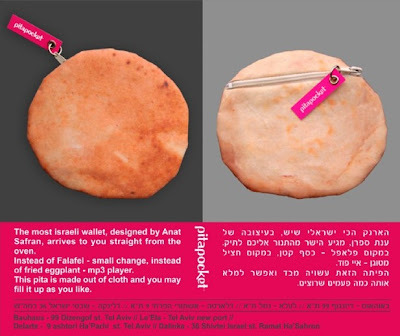 "The most Israeli wallet, designed by Anat Safran, arrives to you straight from the oven. Instead of Falafel - small change. Instead of fried eggplants - mp3 player. 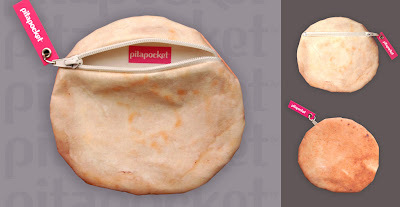 This pita is made out of cloth and you may fill it up as you like." It is no wonder Safran picked up the Pita image for her metaphoric functional art creation. Pita is not just of the most popular food items in every Israeli kitchen. It also symbolizes our life here in the holy land: heavily mixed, stuffed up in a too small pocket and about to be torn apart any second. In case you live on Mars and have no idea what Pita bread might be, the photo below, taken by Israel Talby, is of a few real eatable Pitas. Pita is of course popular not just in Israel but across the entire Mediterraneans and is no Israeli invention in any way (see Wikipedia). According to Saad Fayed, editor of the Middle Eastern Food Blog, this particular food item is served at just about every meal in Middle Eastern dining. That's a lot of people, though I am not so sure most of them will be interested with the bag version. 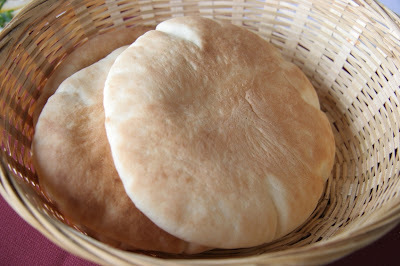 Meanwhile, if you feel like making your own home Pita bread already try this easy pita bread recipe from Fayed. You are promised to "say goodbye to store bought pita forever". More none Pita cool bags at Safran's site and more amazing logos and typo graphics at Oded Ezer's. It was on November 6, 2001 when Fox Network launched their later to be Emmy and Golden Globe award-winner TV series 24 and the idea of an Afro-American president to the USA was still a futuristic "what if" Hollywood experiment. 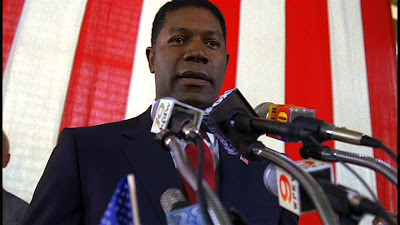 Dennis Haysbert looked convincing and promising as David Palmer, commander of the world's most powerful armed forces. But it was just a TV series. In just a few hours from now Air Force 1 will be landing in Ben Gurion airport and I wonder if it might has anything to do with the fact that today, six years and two months of George W Bush later, Israel's second popular daily newspaper Maariv had the front page of its print version covered with one of the most amazingly ridicules titles any Israeli daily ever came up with. A scan is here on the left but as you probably can't read Hebrew I'll freely translate it. 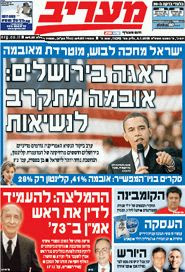 It says "Concern in Jerusalem: Obama Gets Closer to Presidency". Concern in Jerusalem??! I know for some, perhaps most, Israelis saying goodbye to George and his - how shall I put it - "approach" towards the Palestinian issue, Middle East and conflicts in general must be sad. I know Obama is Afro-American. I know he is a democrat. But concern? It sounds a bit dangerous when Israel is "concerned" over something, isn't it? My guess is that someone at Maariv came up with an idea to use this half-threat half-complaint and convince Americans they just have to make this minor adjustment to their constitution and have George elected for just four more years. Otherwise we'll all be far more concerned soon. We might all have a Palmer-Obama as our next commander of armed forces and he might just not like using them as much as we want him to. That would be horrible. It might end up with a little peace in the Middle East. I love being tagged and now I have been by Leena of ConceptisAddict. This meme is a list of folks who decided to share their New Year’s Resolutions for 2008. I decided to jump on this link-love-train as I do have at least one important resolution to confess and it has a lot to do with Leena who tagged me in the first place! 4) do not do them. So, the purpose of this little game is to let us know which category you are in. Copy from “*Start Copy Here*” through “*End Copy Here*” and post it. Before “*End Copy Here*” tell us who you are, your site(s) (with link) and your New Year’s Resolution, or not. Then tag as many others as you like, from one to your entire blogroll, your choice. If you like, create an intro paragraph to your post that also acknowledges who tagged you. Juliana – Juliana’s Site My New Year’s resolutions are looking for a part time job, keep blogging, and learn to cook and bake. Michelle - Rusin Roundup1. Learn to be happier and accept myself for who I am, 2. Is to lose about 25 lbs., and 3. Is to stop smoking. Karen - Grow Rich Along With Me My resolution for next year is to achieve $3K per month passive income by the end of 2008. Mel - Attitude, the Ultimate Power ;“I don’t need no stinking resolutions.” I never hold to them anyway so why frustrate myself by starting them now. Sandee - Comedy Plus I don’t need no stinking resolutions either. Years and years ago I did them because everyone else did, but not once did I follow through. Why set yourself up for failure? 1. Health: Continue exercising twice a week, eat enough veggies and fruit, have enough rest, take vitamin C regularly and women’s multivitamin during my period. 2. Spiritual: Improve my Daily Bread reading routine and my prayer life and learn more from God’s Word. Max - MAXMy New Year’s resolutions are to dedicate more time to my friends; to finally be able to read “Der Spiegel” in German; to be calm when organizing my marriage; to go one last time to my favourite club and dance the night away; and continue to be happy! Eric - Speedcat Hollydale - I love chicken. Problem is that I really never get to have enough chicken! My New Year’s resolution is to enact “Chicken Tuesday”. On this day I will eat only chicken, blog about chicken, and promote chickens all over the world. (hormone free) Join me, won’t you? Marzie - Mariuca ;- My resolution for 2008 is to enjoy a healthier lifestyle and to expand my Perfume Collection. Sindi- Life Is A Roller Coaster - My resolution is to complain less, pray more and be a little more thankful for what I have. Judy - Sugar Queen’s Dream First Time Dad - My New Year’s Resolution for 2008 is to be a better father…now I don’t usually make New Year’s resolutions because I never keep them but this one I better keep! Happy New Year to one and all! Mauro - 1 Million Love Messages - My resolution for next year are: 1. Change my job (maybe work online). I’m really unhappy in the actual one. 2. Dedicate more time to my family and girlfriend… 3. Work hard in 1 Million Love Messages and reach 2500 Love messages (or more) in the end of 2008. MidgetManOfSteel - Mental Poo - To get out of dealing with people who I have no desire in helping at the job I’m doing…catch the eye of someone who can see that I can write and be funny…and get my own ticket to happiness from my humor….and a Ferrari. While I’m doing this, I resolve to get a Ferrari. Stacy - My Thoughts My New Year’s Resolution for 2008 - Is to be more understanding to my children and to other people, Not to curse at others while I am driving, try to eat right and exercise, try to volunteer in my community, and to believe more in my spiritual side. Jason - DatCurious.comDatMoney.com Although, I normally don’t do New Year’s Resolutions (because I find it as an excuse to actually do something I should’ve already been doing), this year I will plan on giving back to the blogging community, especially my audience. I’m not sure how I will do it yet, but I definitely will. Leena - Conceptisaddict- My resolution years ago was that I do not do resolutions! I can however promise to keep on solving puzzles and blogging. A plan to allow "domestic view" of data obtained from satellite and aircraft sensors that can "see through cloud cover and even penetrate buildings and underground bunkers" has been recently approved by the USA government. For the good and bad of it, Information age enhances the ability of states to control citizens and of business corporations to enlarge leverage our privacy into profit: better security means more information in corporate hands and less privacy. Furthermore, Information age allows business corporations and states to deliver their message more efficiently than ever before. This means more products, more advertisements and less free public space. Yet, Information age also allows activist groups and their counter messages to be heard by millions. Following is a fresh collection of popular and particularly interesting strategies, case studies and resources demonstrating the two-edged sword face of new media - where counteradvertising, commerce jamming and propaganda remixes make a stand. According to AdBusters Media Foundation, publishers of the most popular subvertising magazine in the world and a leading activist group based in Vancouver Canada, well made subvertisments need to efficiently "mimic the look and feel of the targeted ad, promoting the classic 'double-take' as viewers suddenly realize they have been duped". 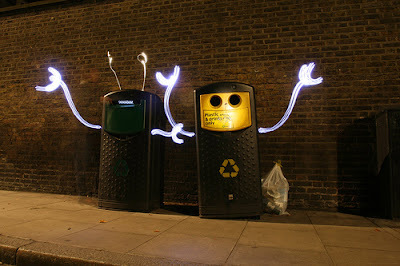 With a list successful media projects such as the TV Turnoff Week which was aired on CNN, the Buy Nothing Day videos of 2006 and 2007 and a series of viral TV subvertisments titled The Product Is You, AdBusters continue to demonstrate how TV commercial language can be altered and manipulated to "cut through the hype and glitz of our mediated reality" and reveal "a deeper truth within." 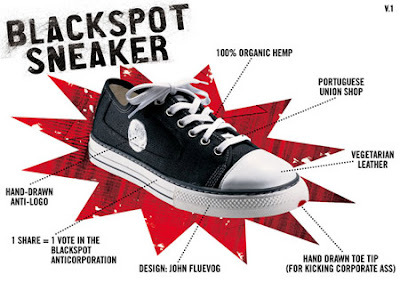 The Blackspot sneaker, designed by John Fluevog, is Adbusters' recent Commerce Jamming project, a first Anti-Brand and your chance to "unswoosh Nike's tired old swoosh and own one of the most Earth-friendly shoes in the world": 100% organic hemp upper, recycled tire sole, made by Vegetarian Shoes in a European union shop including a hand drawn (!) logo plus. 2. Busting Phillip Morris: Why are you buying your food from a tobacco company? In fact, some culture jamming ads carry indisputable facts about their targets making some disturbing unfamiliar truths to be a little more familiar to the public. "Why are you buying your food from a tobacco company?" 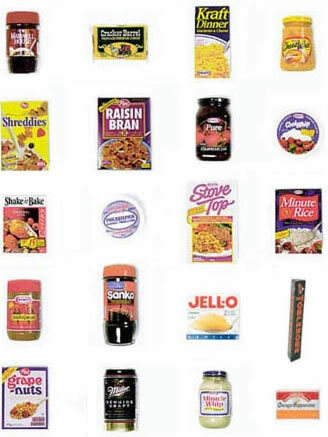 showcased a list of popular food products owned by Phillip Morris, the world's largest cigarette company: "...Chances are that you've been helping to promote Marlboro cigarettes without even knowing it. You can withdraw that support by personally boycotting these products" the ad said. "It's like giving money to a health organization that is working to find a cure for cancer - but in this case you are taking money from a corporation that causes it. So next time you go buy food- try it. You'll like it." 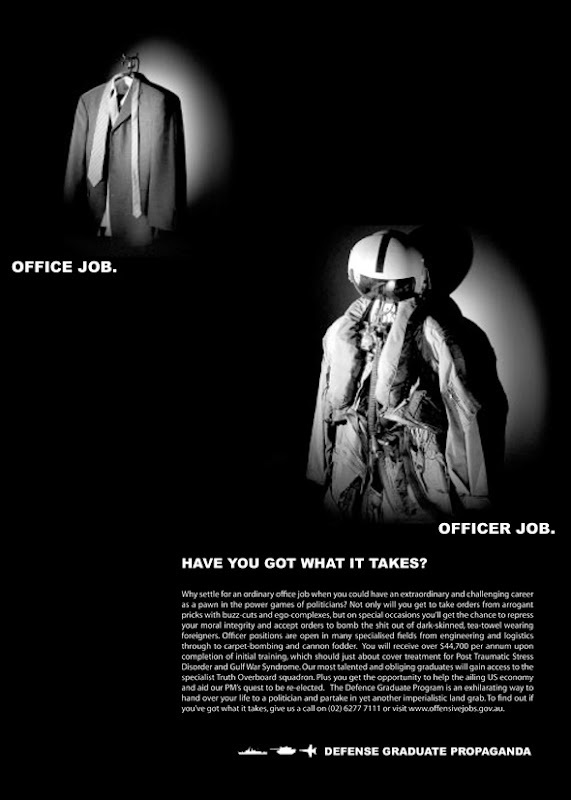 In March 2003 Australia's Department of Defence has withdrawn advertising from all student media across the continent in response to a controversial full-page parody of Defence recruitment advertising published on Vertigo, a student newspaper at the University of Technology, Sydney. 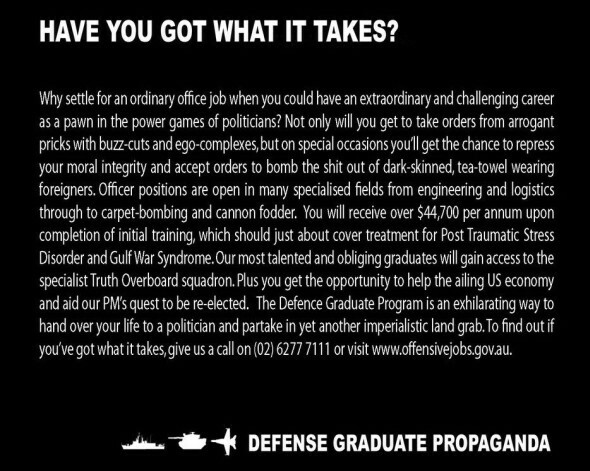 The spoof ad satirically portrayed the Department of Defence as "a political tool of an Australian government intent on participating in an unsanctioned invasion of Iraq" and was followed up and reprinted by other student publications. This act of solidarity was like a golden medal to the Vertigo activists who saw the fact "students are no longer being inundated with inaccurate representations of the Defence Force" as a great victory. 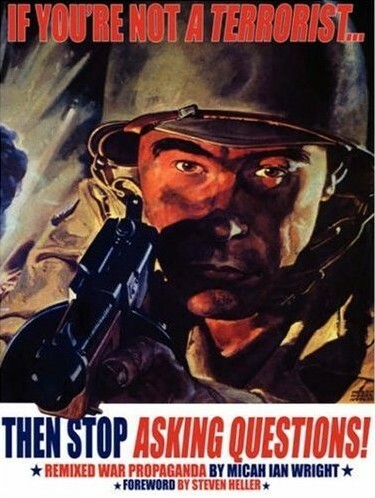 Vertigo spokesperson, Jano Gibson argued that "the 'exciting', 'inspiring' and 'feel good' Army ads that appear in uni diaries, on billboards and television differs extremely from the reality of participating in a war" and that Vertigo's parody "simply corrects the omissions of the Department of Defence." For a larger version download the pdf here. Sometimes facts are not the issue neither is the spoofer's opinion and the busted ad is made either "for" a non-existent product, or with a real one simply as parody of advertisements. Rarely, a familiar brand language is mimicked so well that the entire world is successfully fooled. 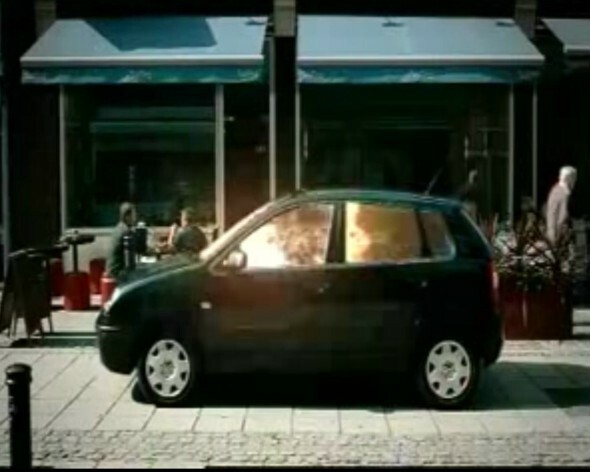 In January 2005, managers at German car manufacturer Volkswagen found themselves in the center of a global row after a meme hack sick video joke featuring a Palestinian suicide bomber in a Polo car was virally distributed across the world via the internet. The spoof TV advert showed an "oriental" looking man stepping into a Polo car wearing a keffiyeh scarf, known as a symbol of Palestinian nationalism. After driving around the city for a while the driver stops near a resonant populated with lots of innocent civilians and detonates, yet leaving the car intact. 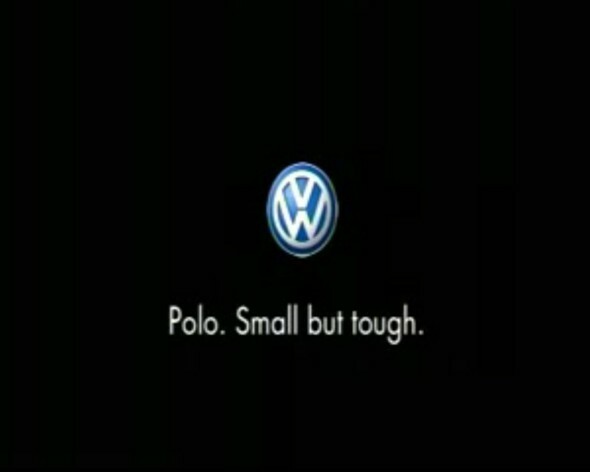 The video was punched-lined with the familiar style slogan announcing "Polo: small but tough". Check it out and see for yourself: Even though it is not very clear which "deeper truth" is actually being revealed here, this culture jammer was mimicking the familiar Volkswagen language so well it simply got people to believe it’s a real one. "Please download the large version and pass it along to forums, websites and other people who might appreciate it. Spread the meme!" 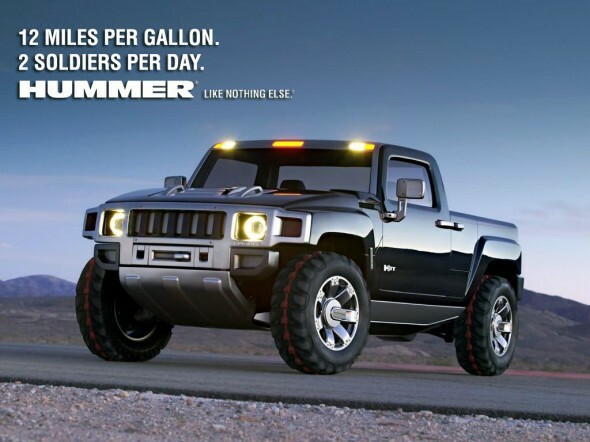 – Those were the words of Dave Ward, a professional photographer who in 2005 created two anti-Hummer spoof ad campaigns. 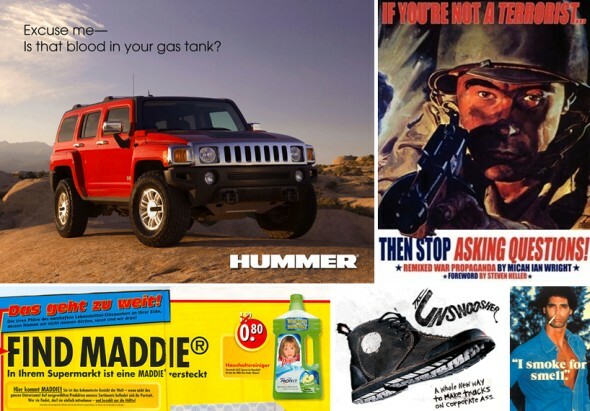 Suggesting the real reason behind the ongoing blood shed in Iraq is to support America's oil demand fueled by manly Tofu hater ego-driven cars of the Hammer type, Ward's anti-war eco-friendly spoof ad became almost as popular as the originals and were massively and virally distributed on Internet. 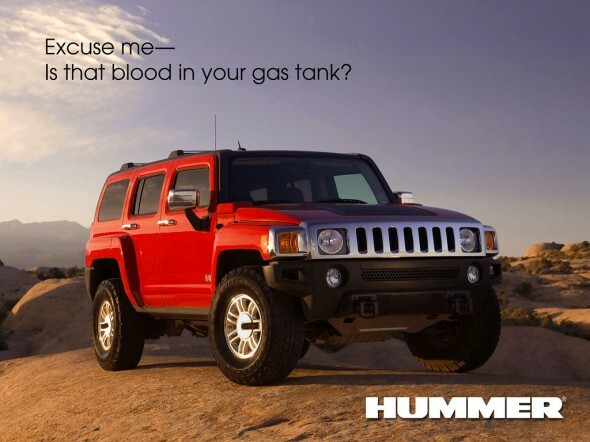 In July 2006 the second Hummer ad titled "Excuse me - Is that blood in your gas tank?" showed up on Ads of the World, a commercial advertising archive for the best and most interesting creative work worldwide. I bet they didn't like this so much at Hammer's headquarters but in light of recent developments in America's approach to international global climate responsibility you might say this culture jamming attempt might have had some part in making a change. Not all ad spoofs are made with humanitarian causes in mind and some are made for profit or publicity and leave a very bad taste behind. 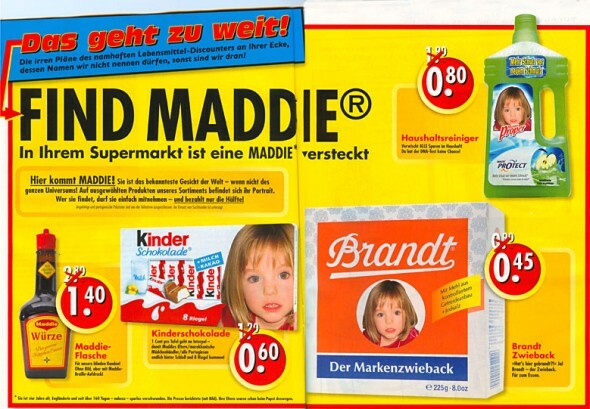 An 'advertising' spoof published in a German satirical magazine named The Titanic included an allegedly double-spread ad for a supermarket, depicting a number of products promoted with the image and name of Madeleine McCann's. This poor-taste parody was later described by Madeleine's parent's spokesman as "extremely hurtful". Not much to say about this one. Perhaps just that it's a good example for a 'not very funny' spoof. Other spoofs can be very funny and can hardly defined as unjustified by anyone, that is unless you are a lung cancer tycoon. The idea to sabotage the interest of cigarette corporations using their own media weapons is far from being new and came up almost 30 years ago when the Doctors Ought to Care (DOC) organization was pioneered countered development and jamming tobacco ads. In a 1980 paper published in JAMA, DOC founder Alan Blum, MD, wrote that "humor can be an effective tool" in this war. 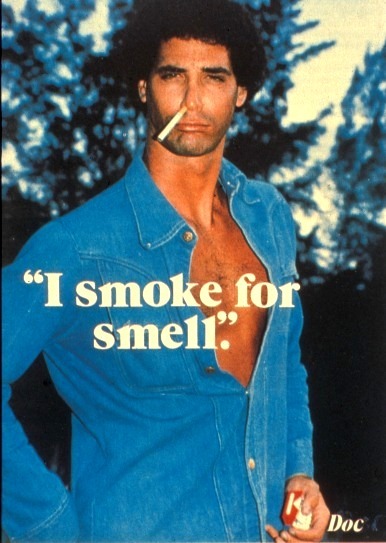 Thus, in one of its poster series, the DOC parodies the classic I smoke for taste advertisement with a picture of a similarly defiant, macho character with a cigarette dangling from one nostril and the caption I smoke for smell. A very popular form of adbusting, sometimes referred to as Billboard Modification or Billboard Liberation, takes the form of alternation of public space commercials and billboards to make a spoof or parody of the original corporate or political message. Usually it is the company that pays for the advertisement that is being under the attack. In some cases, however, the target can be the medium itself. 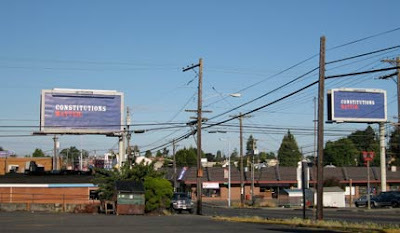 It was August 1, 2007, when the deadline for all billboards in the city of Tacoma, Washington to comply with a (ten years old) law requiring the removal of all (well defined) disruptive billboards. 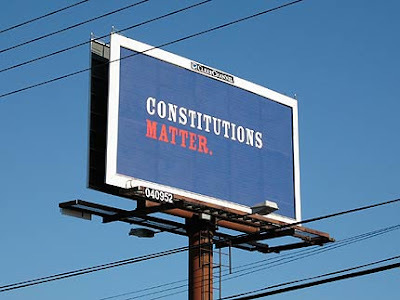 Three days later Pranks, a popular blog by Joey Skaggs dedicated to culture jamming and reality hacking published this follow up about hundreds of billboards in Tacoma which "have sprouted a scary blue and red message reading "Constitutions Matter". All adbusted billboards were left carrying the name "Clear Channel Outdoor", a company of Clear Channel Communications and one of the world's largest outdoor advertising corporations. Photos are taken by Pranks from a local city blog named exit133.com. 9. The Li Peng Story: Step Down to Appease the People’s Anger! Politics, anti-war and freedom fighting were always of the most inviting countermessage battlefields for artists and writers. The story of the Li Peng poem is an extraordinary example of how mass media can be hacked to deliver political counter-messages even under extreme media control standards as practiced by Chinese government. In March of 1991 the overseas edition of the People’s Daily - China’s Communist Party newspaper - featured the following patriotic homesick poem, written by a graduate student from Los Angeles aliased Zhu Haihong. 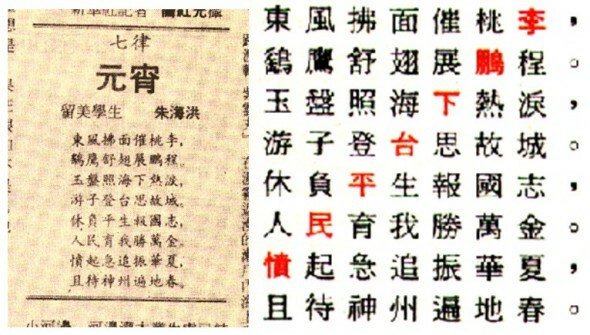 Apparently the poem was a brilliant "qianzi shi" also known as "inlaid-character" poem. Thus, when read diagonally from upper right to lower left the words "Li Peng must step down to appease the people’s anger!" could be interpreted. Li Peng, for those who don't know, was the Premier of China between 1987 and 1998 and the "chief architect" of the 1989 Tiananmen square massacre. 10. The Propaganda Remix Project: YOU Back The Attack! 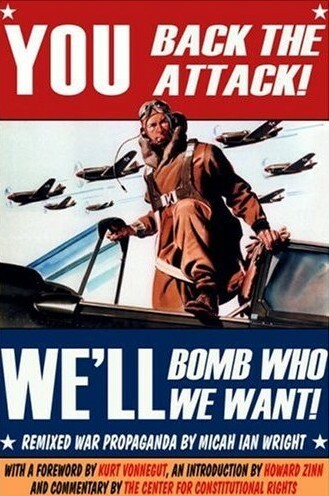 WE'LL Bomb Who We Want! Lastly, and with no intentions of getting into any blue-red American politics, here is another great example for political counter messages targeting war propaganda: Micah Ian Wright is an American author who works in film and television and also the person behind YOU Back The Attack! WE'LL Bomb Who We Want!, a compilation of his Remixed War Propaganda with introductions by Howard Zinn and Kurt Vonnegut.